Will “Crazy Rich Asians” make us forget the “screwed over poor Asian Americans,” and all the rest of us? Yes, we know Asian Americans are not a monolith. But pop culture is about to give us all a facelift. This is fair warning if you are one of the baby boomer Asian Americans, offspring of the early pioneer immigrants, both before and after 1965. If you were a descendent of legendary civil rights plaintiffs like Yick Wo or Wong Kim Ark, you represent four or five generations of ABCs (American born Chinese), and you have the scars to prove it.If you are American Filipino like me, whose father arrived in 1928, same diff. You might even be asking if your Asianness is wearing off. Aren’t we just American yet? Well, no. In the white tilt of the Trump administration, foreignness is an issue. And as I said, we are about to get some new media treatment that will almost surely overturn the dim sum cart. In August, the movie version of Kevin Kwan’s book, “Crazy Rich Asians,” is due, and judging from the just-released trailers that came to my inbox on Monday, it could modernize the view of Asian Americans.But not necessarily for the good.If you don’t know Kwan’s wildly successful book series, maybe it’s time you do.Kwan was born in Singapore, came to America at 11, went to the University of Houston and Parsons School of Design, and then went to New York to work with Interview magazine and Martha Stewart. Soon after, he began his own consulting business working with household names. But it’s his writing where he’s made an impact, telling the story of rich Asians who come west for school, then return to their privileged Asian life style–totally different and alienated from their Asian homeland.Kwan tells mostly their story. This is different from those of us born here to immigrants, get a western education because, well, we’re here. Some of us get elite educations, and then can find ourselves totally alienated.Same thing, sort of. We just don’t have to travel as far. We’re already home.The title of Kwan’s book signifies the main differentiator, as the “Crazy Rich Asians” are in a wealth stratosphere of their own. Whereas the ABC types might be comfortably upper middle class as doctors, lawyers, or professionals. They may be in the 1 percent, but are they “crazy” rich? Likely not. At least not to the point requiring psychotropics.But “crazy rich” is the media image about to hit the big screen come August.These Asians are in a $ league of their own, and not to be confused with real Asian Americans.Indeed, they are global capitalists, modern jetsetters, a kind of Asian wealthocracy. Can they even relate to the nine Korean American waiters and waitresses for whom AALDEF recently won a wage theft judgmentof $2.7 million against Ji Sung Yoo, owner of the Kum Gang San restaurants in New York City? The crazy rich Asians probably relate more with Yoo, the restaurant owner, but probably don’t even consider him that crazy rich if he wasn’t able to get away with defrauding some low wage Korean American waiters and waitresses. (Two Latino bussers were also included in the judgment. )If you ask me, Asian American life is a whole lot closer to the waiters and waitresses who worked 12-hour shifts without break for six to seven days without overtime pay. The restaurant owners even kept some of their tips, and ordered them to do extra work on a local farm to harvest vegetables. If the workers didn’t comply, they lost their jobs. Those who threatened to sue faced deportation. They sued anywayLast week, a federal judge stopped the owner from hiding his assets and forced him to pay a $2.7 million judgment for the workers.They don’t become crazy rich, right away, if ever. They still have to collect it from the restaurant owners. But what they got is something much rarer for an Asian American to get in America. They got a taste of justice for the unfairness they were forced to endure.These are the hard-working Asian Americans who are about to be eclipsed by this new image that comes out of “Crazy Rich Asians” in August. Don’t get me wrong.I wish Kwan and his movie all the best. The movie trailer looks like a Full Employment Act for Asian American Actors, and I’m all for that ,dabbling in a little stage work myself (Amok Monologues coming to the Orlando Fringe in May). 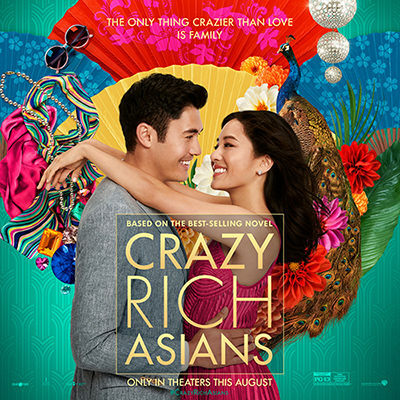 The movie has “Fresh Off the Boat” star Constance Wu playing an American-born economics professor who gets involved with a crazy rich Asian, played by Henry Golding, a Malaysian/Singaporean. Wu is the Asian American we know and love, and she sets up the class dichotomy of the movie. Ken Jeong is in the house, as well as Michelle Yeoh, and even Filipino American Nico Santos, the flamingly funny Mateo in NBC’s “SuperStore.” Even “Silicon Valley” star Jimmy Yang is in it. It’s a who’s who of underutilized Asian American actors.But what was Hollywood going to do? Cast whites in yellowface? So there are good points about the film. In general, I’ll reserve judgment until I see more than just a trailer. Will it become “The Joy Luck Club” for a new generation of worldly jet-setting Asians–who knows? Still, this image of the crazy rich worries me. Most Americans already have such a monolithic view of Asian Americans. They don’t even see the Asian American poor in our communities. We know how the Asian American STEM/Tech millionaire thing is already pervasive. But a STEM millionaire is just middle class compared to the Asian crazy rich. The immigrant prince who comes west for school then goes back east to the homeland as a new kind of hybrid Asian may lead to a whole new reaction. And the evolution of a whole new stereotype.Is this what has become of the “Model Minority”?